When taking the Assistants to Infancy training we studied the development of movement (voluntary and involuntary). Among the voluntary movements there are many important milestones, including one important one that my own child has just mastered, crawling. 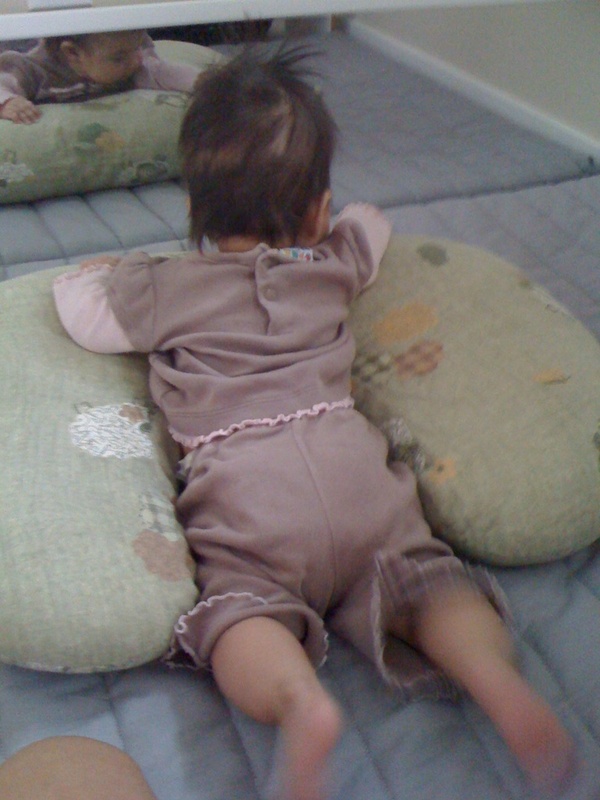 One of the most important preliminary exercises that will assist a baby to learn to crawl, is tummy time. The importance of tummy time cannot be understated as it leads to the strengthening of a baby’s core, back and neck muscles, eventually strengthening the shoulders, forearms and wrists; all contributing factors to a baby’s physical development and ability to crawl. In Montessori we have a place for everything and everything has a place, therefore we have a specific area for babies to exercise, (which of course includes “tummy time”), and we refer to it as “The Area for Movement”. The Area for Movement consists of a movement mat, a mirror, and a low shelf with different material (toys) as well as some pictures on the wall and mobiles hanging from the ceiling. The movement mat is an important tool to use since it will allow the infant to develop voluntary movement in a safe and comfortable place. This place also encourages the infant to be independent since he/she is able to explore different objects, observe mobiles or just practice some rolling on his/her own while mom is observing from the distance. 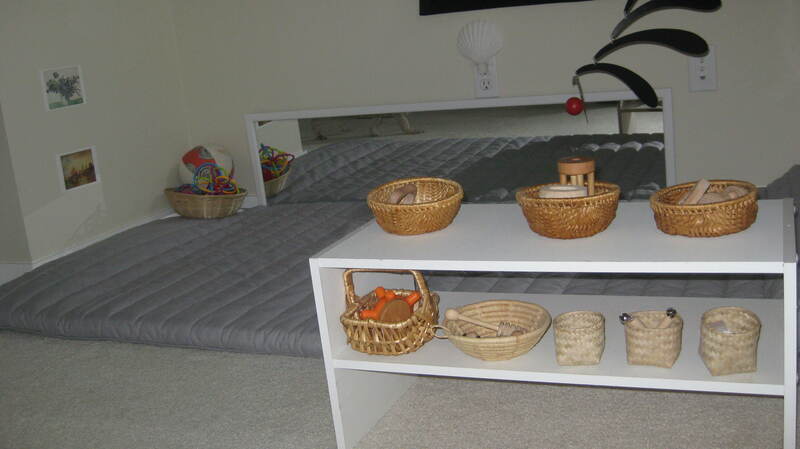 The Area for Movement could be placed in the infant’s room or in the living room, whatever is most suitable for your family’s space and preference. We chose to arrange the area in our Daughter’s bedroom. Putting my Montessori education into practice with my child is not always as easy as I would hope. We introduced tummy time to our daughter about two weeks after we brought her home from the hospital, which at the time was quite easy to do as she seemed to prefer sleeping on her stomach (not doctor recommended due to a higher risk of SIDS). After a month or two she became very fussy when we put her down on a flat surface such as her movement mat. Our daughter would become very upset if we left her on the movement mat for more than a minute or two and I struggled to find a solution to this problem. The solution that finally worked was quite simple: We started placing our daughter on her stomach for a very short time (about 20 seconds worked for us, but each baby is different so if you baby is more comfortable on the mat you might go longer), once or twice per day. While she was on the mat, my husband or I sat with her and showed her various materials such as rattles and pictures. She slowly became more comfortable spending time on her tummy and as she did we increased the amount of time from 20 seconds to 30, 40, etc. and gradually increased the number of tummy time sessions to 3-4 per day. This process took a lot of patience, but it worked. At 5 months my daughter started sitting up on her own and wanted to be in this position at all times, but I still managed to encourage tummy time every day. At six and a half months she started creeping backwards and rolling to places to get around; at seven months she was on her hands and knees, a good sign that she would be crawling in a month or so. She stared crawling a week before she turned nine months and I was the happiest mother ever as all of my efforts, and hers, had been rewarded. For more information on your babies growth, care and development in the first year, I recommend the book: Baby Day by Day, by Dr. Ilona Bendefy, DK Publishing. Why Motor Skills Matter, by Tara Losquadro Liddle, M.P.T., McGraw-Hill. I also highly recommend the following article about the importance of crawling: What’s So Important About Crawling?